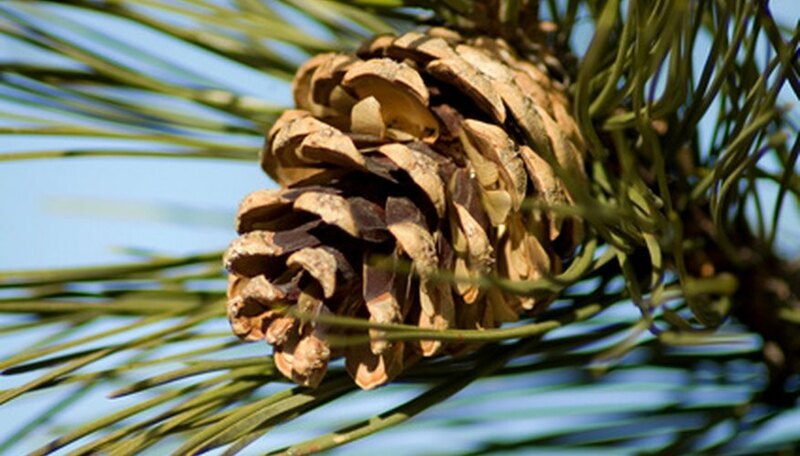 Collecting pine cones is the first step in growing a new pine tree from seed. No, the actual pine cone is not the seed, but the seed container. When you pick up a pine cone, it is actually the female cone of the pine tree. The male cones are very small and only last for a couple of weeks on the tree. They release pollen that falls between the wooden petals of the female cone, which in turn produces seeds. Find some 2-year-old pine cones that have recently fallen to the ground. Pine cones don't reach maturity until after two years, since the first year is spent developing the seed within the cone. Look between the bracts to make sure that there are a few seeds visible in your cones. They can be identified by their thin wings, or you can break open the cone. Dry the seeds by placing them in a paper bag in a dry storage area, where they won't be bothered by pests, until winter arrives. You can throw the whole pine cone in the bag if you want to wait until the seeds are ready to fall out. Remove the seeds from the refrigerator after winter has passed and plant them in the same soil as their parent tree grew in. If you did not collect any of the original soil, you can use potting soil that is high in peat moss. Bury the seed about 1 inch deep and water well. Place the planted pine seeds in a sunny window and watch for signs of growth. They should sprout within five to 30 days if they were viable seeds. Keep the soil moist and warm. Transplant the seedling outside when all danger of frost has passed and protect from hungry wildlife for the first couple of years.